Protesters listen during the Trump Free Speech Rally in Portland, Oregon, U.S. June 4, 2017. 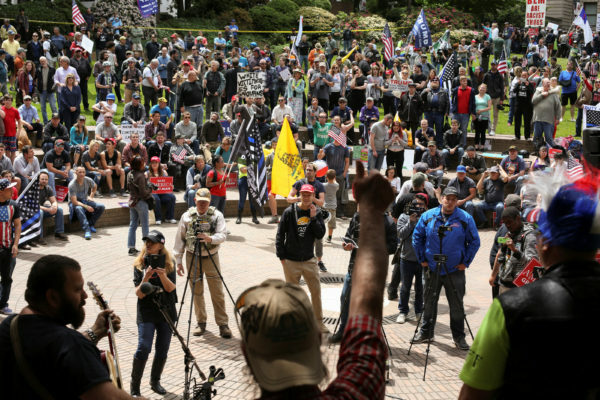 PORTLAND, Oregon — In a city splintered by protest, acrimony and the fresh pain of a pair of killings on a commuter train, demonstrators gathered again — and clashed again — Sunday afternoon, with a right-wing rally drawing thousands of counter-protesters in the heart of downtown. The planned, permitted free-speech and pro-President Donald Trump rally came just more than a week after 35-year-old Jeremy Christian — a man who performed Nazi salutes and screamed racial slurs at a recent right-wing rally here in late April — allegedly stabbed three men, killing two, following what witnesses said was a hate-filled tirade against two teenage girls on a train. The deceased, Rick Best, 53, and Taliesin Myrddin Namkai-Meche, 23, and one survivor, Micah Fletcher, were standing up to Christian as he harassed the girls, one of whom was wearing a hijab. Sunday’s rally – in an outdoor plaza sandwiched between City Hall and the jail where Christian is being held – provided a vivid illustration of the city’s divisions. Between every block were thick lines of Portland police and Homeland Security officers clad in riot gear; they made several arrests. Portland police announced at about 3:30 p.m. that the antifa assembly was considered unlawful before deploying a volley of flash grenades into the crowd of counter-protesters, sending black-clad demonstrators running.